The Midland Highway is not the world’s best or most scenic driving road. The road is not dual carriage way for the most part, which means if you’re unlucky you’re constantly hanging out for the next overtaking lane. Either that or you’ll be doing the speed limit and you’ll be over taken by a local in a hurry to catch the cops. In an effort to make the 2.5-3 hours drive more bearable, locals along the route have put up silhouettes along the roadside. Drivers are kept alert and passengers get to practice photography from a moving car. See if you can spot them – see all 16 here! 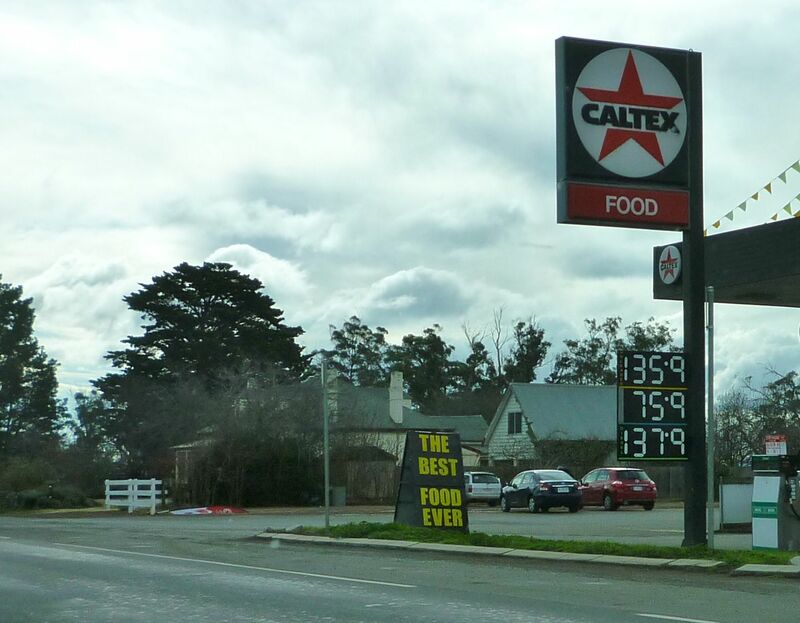 Although highway super-stops (petrol+fast food) have become common on the mainland, it’s an idea that doesn’t seem to have caught on in Tasmania. If you run out of fuel – be it food or petrol – you will need to stop in one of the town off the highway, or a roadhouse along the way. This one promises to make you stop worthwhile! The country around Hobart is really very dry compared to the lush northern and western areas of the state. Driving up the Midland Highway shows you just how challenging farming in some parts of this island state can be. Leaving Hobart, you get to pass through Bagdad. I’m don’t think there’s anything touristy there. Here’s the Wikipedia page for Bagdad, Tasmania if you’re curious. I only mention it as a bit of trivia. Oatlands is a small town that’s coming back to life with the restoration of the Callington Mill, the Georgian windmill built in 1837, that has always been a landmark of the area. You can see it from the highway even if you don’t stop to see it working or buy bread made from flour milled by the Mill. Oatlands is more than the mill though. If you have time in your itinerary, have a look at what else there is to see and do in the region. We enjoy stopping at Ross (which is roughly half way between Hobart and Launceston) for a famous Tasmanian Scallop Pie! There are two bakeries in Ross – both have good scallop pies, however it’s Bakery 31, the wooden place that looks like a tea-house, that makes the scallop pies that has put Ross on the map. 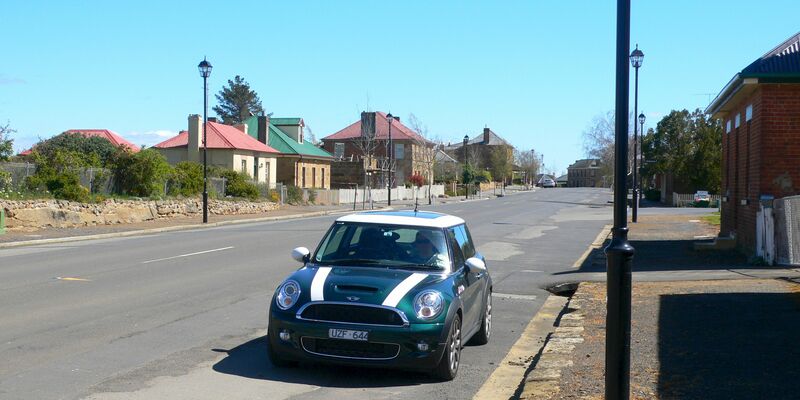 Named after a city on the River Tay in Scotland, Perth is small town on the outskirts of Launceston which is where you will find the Tasmanian Honey Company. We love their leatherwood honey so much we buy it in 2kg tins and go through 3 (or 4!) of these over winter! It’s raw honey that you can stand a knife up in, and it’s just perfect in our morning porridge. Conversely, the amount we consumer over summer can be measured in teaspoons. Luckily honey doesn’t go off. If you’re not a fan of the strong leatherwood taste, they have quite a range of different flavours, all available to taste, and they also sell other honey-related products – Stephen quite likes their honey lollies! The shop is open Mon-Fri, 9.00am – 4.30pm; unfortunately not on weekends. You can find their honey for sale in a number of places around Tasmania, but it won’t be the whole range, and you won’t necessarily get to sample all the different flavours. Evandale is just east of Perth, and is home to the National Penny Farthing Championship. Not a bicycle I’d like to fall off! The small town is also cultivating its own art scene (it’s also home to The Glover Prize) and on our last visit we also noticed a few boutique clothing stores. The purpose of our visits to the small town is to stop at Ingelside Bakery Cafe for Evandale Olive Oil – a peppery green extra virgin olive oil that is heaven on bread (strictly as a treat, of course), and lends and interesting peppery flavour to salads.